GROVE CITY — Rock’s most notorious bad boys, Guns N’ Roses, gave an otherwise lackluster concert scene a strong shot in the arm Saturday night at Capital Music Center with a show that will not only be remembered as the best of the season, but also as one of the best ever. The 21/2-hour rock out was simply incredible. The Gunners are touring in advance of two upcoming albums, Use You Illusion I and Use Your Illusion II, which will be released simultaneously in July. Two songs into the set, between blistering versions of Nightrain and Mr. Brownstone, singer Axl Rose kicked the band’s set list off the stage. That loose approach made for a fabulous, free-form performance, albeit with the inevitable delays between songs as the band decided what to play next. A request from the audience resulted in the group’s first rendition of Used to Love Her in more than two years, and the band’s choice of covers ranged from Paul McCartney and Wings’ Live and Let Die and Alice Cooper’s Only Women Bleed to Bob Dylan’s Knockin’ on Heaven’s Door. Two new band members, drummer Matt Sorum (formerly with the Cult) and keyboardist Dizzy Reed, strengthened G N’R’s rock solid line-up, but it was guitarist Slash, his face obscured by long sheepdog locks, and Rose, with his raw and raspy vocals and step and slide moves, that demanded the audience’s attention. Since the band’s aim for the evening was “to rock out and have a good time” instead of promoting products that aren’t even available yet, the Gunners were generous with their older material. While Rose delivered Patience in a deep croon, he sang Civil War like a man possessed, with palpable energy emanating from the stage. 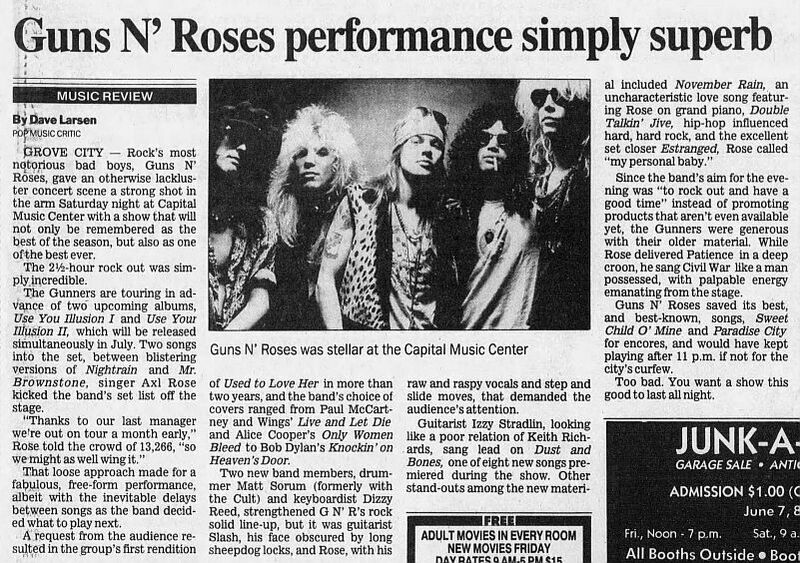 Guns N’ Roses saved its best, and best-known, songs, Sweet Child O’ Mine and Paradise City for encores, and would have kept playing after 11 p.m. if not for the city’s curfew. Too bad. You want a show this good to last all night.